"A prodigy inventor, Koji spends much of his time in his workshop, tinkering and inventing things." Least Favorite Thing: When it's "too late for inventing right now, Koji. Go to bed." Most powerful unit type. Able to use a special ability. If they fall the battle is lost. Koji is a commander in the Heavensong Empire. 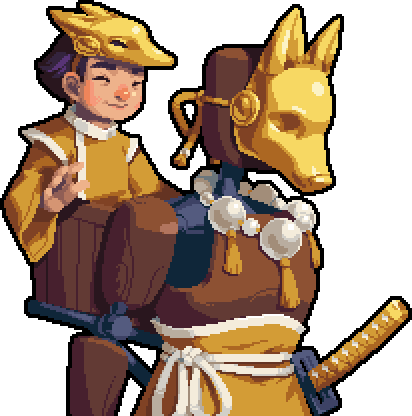 He is the son of Empress Tenri, and he rides into battle on his giant wooden puppet, Tenko. The son of Empress Tenri, Koji is an enthusiastic and committed young commander. Although he is still developing his skills, he is nevertheless an impressive kid - especially when it comes to the weapons he creates. Koji's most remarkable creation to date is Tenko, the 12-foot tall fox puppet he pilots. Koji's mother is the profoundly respected ruler of an expansive empire, and this young prince is next in line to the throne. He is a generally happy kid, even though he feels he has a lot to live up to, and manages to be a buoyant optimist who never lets the weight of expectation bring him down. Whatever he does, he does to the best of his ability. What more could anyone ask beyond that? Koji's love of engineering was inherited from his great aunt Mari. With his grandparents gone, and Tenri and Hiraku so busy in their duties as empress and consort, Mari stepped in as an extra parental figure. She was a fine inventor who had helped develop many of Heavensong's machines of war, as well as much besides. 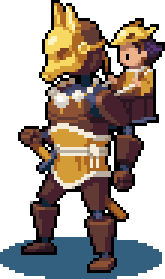 It quickly became obvious to Mari that Koji, too, was capable of mastering mechanics and engineering given the right support, and when he was just two, she took him to see her workshop. She set him on the floor and turned away for a second, only to turn back and find him several feet from where she'd left him, wrench in hand, loosening the bolts on her latest creation. Perhaps counter-intuitively, she took him to the workshop every day she could after that. Koji's Groove is Sparrow Bombs. When used, two unique Sparrow Bomb units are spawned nearby, which may then immediately move up 5 spaces and detonate, inflicting 50% of Koji's maximum damage on nearby enemy units. Sparrow Bombs are capable of dealing huge damage to groups of units, or even to enemy commanders. However, care must be taken to ensure that they are not destroyed by ranged units before they reach their target. Koji is voiced by Amber Lee Connors. ↑ NinEverything, Massive amount of Wargroove footage, YouTube (video), Published on Jun 10, 2018, retrieved 20 January 2019. This page was last modified on 24 March 2019, at 02:27.